● To get the most savings when shopping at Headline Shirts, visit the Today’s $9 Tees section. All shirts here are sold at $9 for a very limited time, down from their $24 regular price. ● You may also shop the sale section and save up to 40% on featured items. ● Coupons mostly offer dollar savings or 10-20% off shirt orders. Some coupons may require you to purchase a minimum number of shirts or meet a qualifying order amount. ● Like the store’s Facebook page to stay up to date with new coupon releases and special offers. ● Orders ship within the US and Canada for a $4.95 flat rate. Headline Shirts features a variety of unique, humorous apparel items for men and women. Sophisticated humor is definitely the main point of the shirts and other apparel products you can purchase through this site. 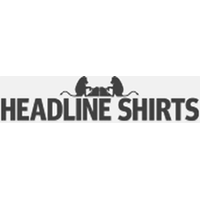 Headline Shirts features a variety of opinions and visuals across possibilities like t-shirts and hoodies, which are available for both men and women. In addition to this, you can use this t-shirt retailer to purchase socks. The GAMAGO section of the website for this company is also worth checking out, in addition to the section devoted to best sellers for men and best sellers for women. Orders over forty dollars are subject to being shipped for free. For most up to date offers check out Headline Shirts on Facebook and Twitter or contact Headline Shirts Support for any questions.